I’ve been dragging my feet on re-finishing the outside of the Big House, namely because of the windows. 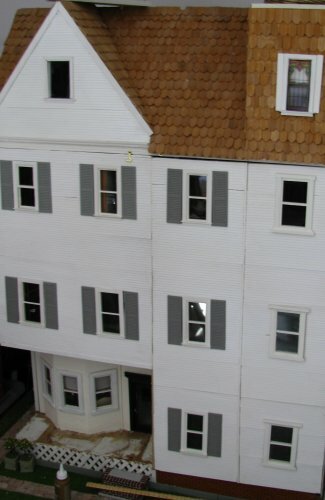 When the plans for Windflower Manor were published, there were different sizes of windows on the market. The plans called for windows that fit 3 x 5 openings, and my dad and I cut the holes accordingly. 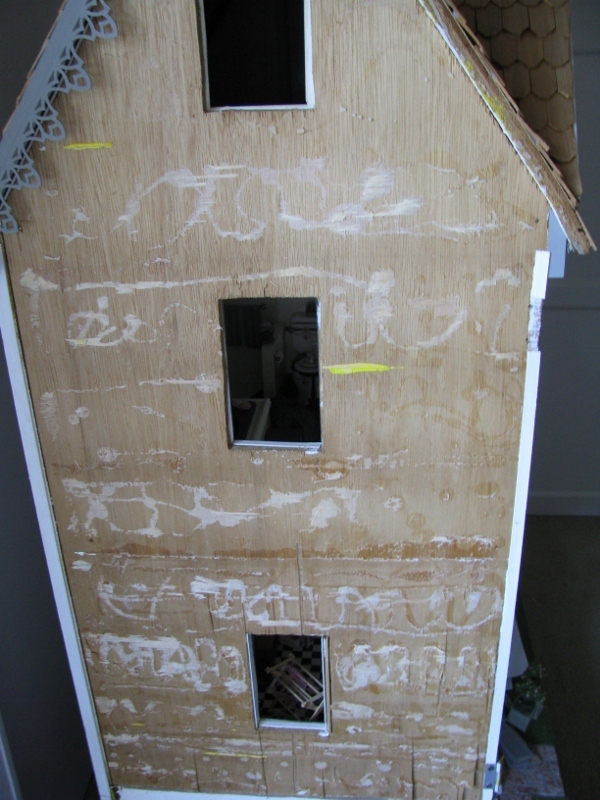 What neither of us realized was that already commercial windows were being standardized to fit kits on the market (and probably kits were standardizing to fit commercial windows). The most common window is now made to fit openings of 2 9/16 by 5 1/16, and designed to go into walls 3/8 thick (Dad and I used 1/2″ plywood). So, by the time we went to put windows in it, already the 3x5s were off the market. I made do by hacking a bit of height off the commercial windows and framing the sides to fit. However, I was inexperienced at minis and didn’t make the best job of it. Now, I’m pulling off the plywood and all interior framing, back down to raw wood. What to do about the windows? I have to say that all options seemed like a lot of work, and none were appealing. I whinged about this for a long time. Finally I said, “What the heck? I’ll make my own windows.” And here are a few I’ve finished. Faced with this daunting task, I went through all the books I’ve collected over the years looking for instructions on making windows. The best resources ended up being The Dollhouse Builder’s Handbook, by Fred Stephenson; and Building Miniature Houses and Furniture by Dorie Krusz. 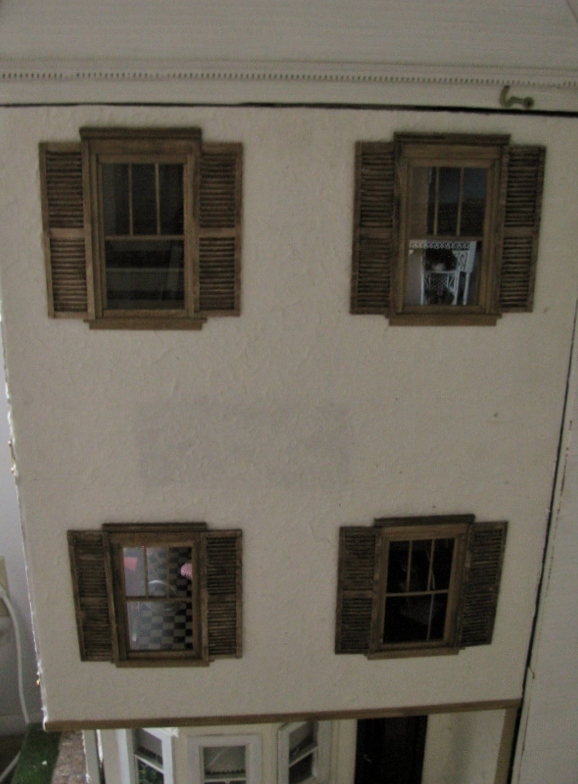 The Fred Stephenson book lists several alternatives for window making, including using Northeastern Scale Models (or whatever they’re called now) strips specially molded for window making. The other book shows how to build frames out of simple wood strips, making notched frames and sandwiching microglass or acrylic between frames, which is the method I used in the Colonial House. 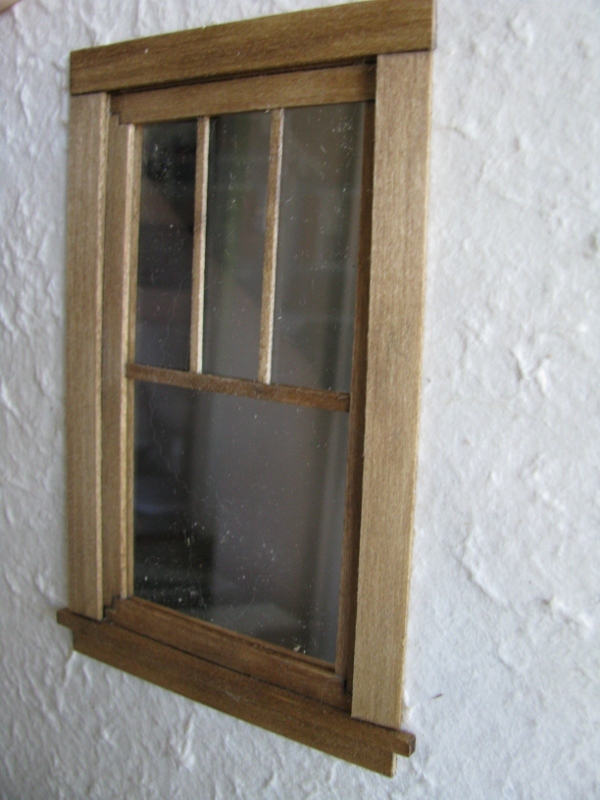 I came up with a method that works will for non-working windows, and can be adapted to make double hung, working windows. Here’s a closeup of a nonworking window (sans shutters and top molding). The big plan is to make nonworking windows for the front facade and the attic windows, and then double-hung working windows for the two sides of the house. I will do a tutorial on how I’m making the windows in another post. I’ve done five thus far and am currently working on number six (one of the smaller, attic windows). Only seventeen more to go . . . I am making a junk store also and I make my windows and doors as it keeps me busy doing these projects. I love yours though good job and cheaper . My moto now is do not buy if I can make it, more fun and satisfying. Most of the stuff is expensive so this is an option.